A remarkable design with retro styling, the Gabriel Bar Stool Black will refresh your bar area in an instant. A heavenly item of furniture with a sleek and striking appearance that will complement an array of spaces, the Gabriel is a sight to behold. 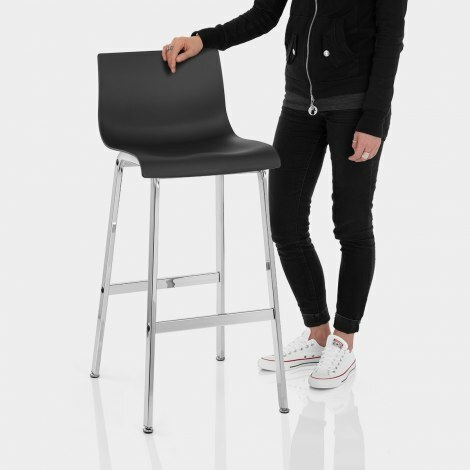 Fashioned to suit the shape of the body and provide great comfort, the ergonomic seat is formed of black matt resin. The minimalist design still offers superb support, courtesy of the mid height backrest. The frame ensures this is a strong and sturdy design. The four metal legs have a fixed design, set at standard kitchen counter height, and also boast a shining chrome finish. A footrest offers extra support whilst adjustable feet and protective pads are included on the underside to help preserve floors. "Very robust and contemporary style"
Very robust and contemporary style. Height perfect for breakfast bar. No gas lift base to gather dust. Will buy more in due course.